Troon North is an 1,800-acre master-planned community in prestigious North Scottsdale. Located along Dynamite Boulevard, east of Pima Road, in the foothills north of Pinnacle Peak Mountain. This community enjoys a dymanic desert landscape - undulating geography, amoungst hugh granite boulders, lush desert arroyos, and stands of ancient saguaros. Residential subdivisions are designed around two public championship golf courses by Tom Weiskopf and Jay Morrish. Estancia is one of the top communities in North Scottsdale. This elegant private guard gated golf community, on 640 acres, wrap around the north side of Pinnacle Peak, Scottsdale, Arizona's famous natural landmark. 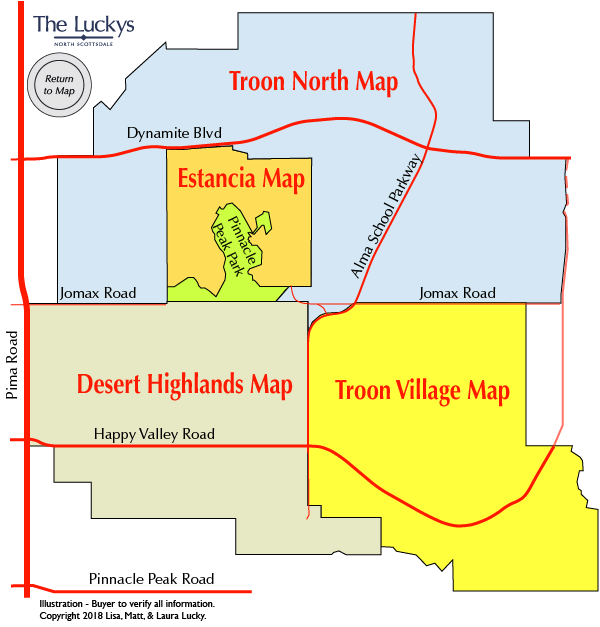 The Desert Highlands area includes the guard-gated Desert Highlands community and several other communities along Halley Valley Road. 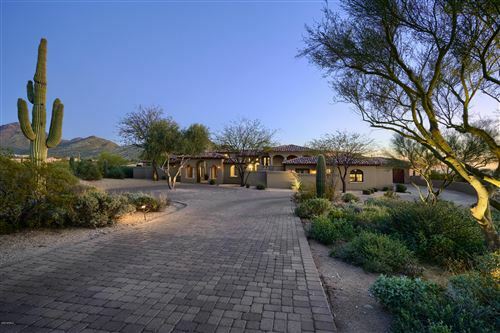 Desert Highlands is an 850 acre residential golf community in North Scottsdale. Desert Highlands is located on the south slope of Pinnacle Peak, one of the area's prominent natural landmarks. Golf membership comes with home ownership and stays with the land. Current membership fee is $75,000 and is due at closing on a Desert Highlands property. Troon Village is a 1,400-acre residential master-planned golf community located in North Scottsdale surrounding Troon Mountain. Troon Village has a wonderful assortment of residential choices from townhomes to semi-custom and custom spec homes, as well as residential homesites. With the higher elevation you will find cooler temperatures and cleaner air. Coming and going you will enjoy distant views of untouched high Sonoran Desert, and mountain views in all directions. 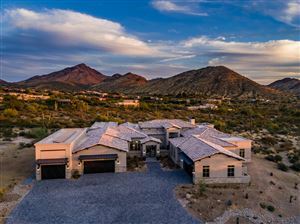 Legend Trail golf community is surrounded by the McDowell Sonoran Preserve and AZ State Land. Legend Trail has production and custom homes. The public golf course, designed by Rees Jones, follows the natural topography of the high Sonoran desert of North Scottsdale. From the community clubhouse, there are spectacular views of Pinnacle Peak, the McDowell Mountains, Camelback, and the Mummy Mountains. Shopping, dining, the General Store, and Russ Lyon Sotheby's International Realty can be found at Pinnacle Peak and Pima Roads. Dynamite Foothills has a rural desert character. This area remains largely undeveloped, and contains desert vistas, broad open spaces and an attractive desert environment. Residents hope this area will keep it's Rural Desert feeling of openness through natural undisturbed desert, minimal impact of development, open view corridors, low building heights, and maintaining the natural desert vegetation. New construction is underway and new developments are anticipated. Two resorts are proposed for this area, which connects the McDowell Sonoran Preserve's McDowell Mountains to the Preserve land north of Dynamite Blvd. McDowell Sonoran Preserve is owned by the City of Scottsdale and it's citizens. The Pinnacle Peak area has some of the best "valley" views and is highly influenced by the presence of the McDowell Mountains and other mountains such as Pinnacle Peak and Troon Mountain. The area is dominated by low density, custom single family homes located in small to medium sized subdivisions. Roughly two-thirds of these subdivisions have public streets and no perimeter walls, while the remaining one-third are gated and have perimeter walls. The most dominant landmark within the area is the cluster of businesses at the intersection of Pinnacle Peak and Pima Roads. This area is high Sonoran Desert, roughly 1500 feet higher than the valley floor with scattered granite mountains, hills, ridges, and knobs. Rainfall is almost twice that of the valley floor creating a thick, lush, and diverse landscape. Because of the elevation changes and the surrounding mountains, there are view opportunities all around. This is one of the most desirable areas in the Valley. Attractions include Pinnacle Peak Park (opened 2002), George “Doc” Cavalliere Park (2012), the Four Seasons Resort, Troon North golf club (public) with two 18 holes courses, Troon Golf & Country Club (private), Estancia Golf Club (private), and the McDowell Sonoran Preserve nearby, providing miles of horse, bike, and hiking trails. Change seems to be venerable. We have seen Reata Pass Steakhouse (2012), Greasewood Flat (2015), and Pinnacle Peak Patio (2015) close recently. Their history includes days as a stop for the stagecoach in the 1880s, a cowboy bunkhouse in the early 1900s, a general store in 1950s, a movie set for Hollywood productions, restaurants/bar, and place for dancing, drinking, and entertaining. All these restaurants were local favorites that attracted people from all over the country. New developments in the area include Ironhorse, Pinnacle Pointe, Talon Ranch, Boulder Ranch, and the Summit at Pinnacle Peak Patios. See all Reata Pass/Troon Area Sold. See all Reata Pass/Troon Area New.